Cut three times early in his career, 35-year-old Joe Berger has become a key to a Vikings line that’s tried to regain its footing through a number of high-profile investments. The player whose football career was supposed to end with the dissolution of Michigan Tech’s football program, whose time in the NFL was to be mostly as a backup, is now in his 12th pro season. Joe Berger is in his seventh year with the Vikings — on his fifth different contract — and is starting at his third different position. On a line that’s been in a state of flux for the better part of the past three seasons, the 35-year-old Berger has gone from versatile reserve to trusted starter. He’s played center and both guard positions for the Vikings, starting this year at right guard after beating John Sullivan out for the center job a year ago and moving to guard in the final three games of 2016 following his return from a two-game concussion-related absence that opened up the center spot for Nick Easton. 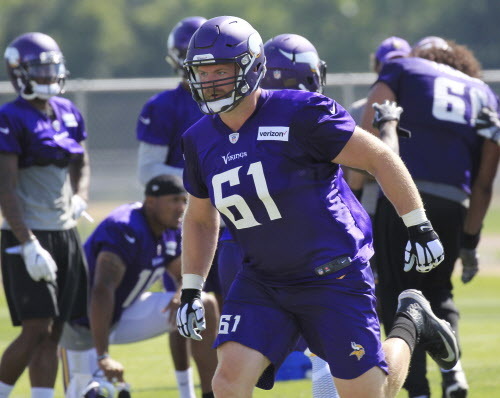 Now, with Easton at left guard, rookie Pat Elflein at center and free-agent additions Riley Reiff and Mike Remmers at the two tackle spots, Berger is the only starting lineman who began 2017 at the same spot where he ended 2016. Berger is playing well, too. According to Pro Football Focus, he’s allowed only one sack and two pressures in 72 snaps of pass protection so far this season, while helping a run game that’s done its best work running to the right side of the line. He had key blocks on all three of Dalvin Cook’s big runs in the first two weeks (a 32-yarder and 33-yarder in the fourth quarter of the Vikings’ win over the Saints, and a 25-yarder in the third quarter against the Steelers). What remains to be seen is how Berger’s time with the Vikings will conclude. He decided to return for a seventh season with the Vikings after debating retirement in the offseason. playing on the second year of an extension given to him once he’d won the center job a year ago. That extension, which paid Berger a $915,000 roster bonus in addition to a $985,000 base salary a year ago, was structured with the idea he’d likely become a backup in 2017. After making $2.2 million a year ago, Berger is earning only a $1 million base salary and $50,000 workout bonus this season, with the ability to earn up to $250,000 in per-game bonuses if he’s on the Vikings’ active roster. According to overthecap.com, he’s the 24th-highest paid right guard in the league, out of 131 total players. Berger can equal his salary from last season by playing at least 90 percent of the Vikings’ offensive snaps this season and earning $900,000 in incentives. At the beginning of a year where the Vikings are counting on him as a starter once again, though, Berger essentially needs to stay healthy to avoid a paycut. The Vikings, to this point, haven’t made a move to change that. It’s not hard to imagine a scenario where Berger — whose long career has put him in sound financial shape — could decide to walk away. So far, though, his return has helped stabilize the Vikings’ line again, in a year where the team absorbed $3.5 million in dead money by releasing Alex Boone at the end of training camp. Between Boone, Brandon Fusco, Willie Beavers and the final signing bonus proration of Sullivan’s deal, the Vikings are counting $8.54 million in dead money for offensive linemen against their salary cap. Berger’s 2017 season figures to be the denouement of an unlikely career that’s lasted longer than most expected it would. Cut three times early in his career, he’s become a key to a Vikings line that’s tried to regain its footing through a number of high-profile investments. With several of those investments gone, Berger the journeyman is still here, quietly playing an important role once again. What if Zimmer did have a crystal ball to predict Bradford's health?